Area 171 A. 1 R. 7 P.
Bridget Lynch Reps of Charles Lynch Esq Private dwelling with 1 rooms. Thomas Connelly Reps of Charles Lynch Esq Private dwelling with 2 rooms. Peter Lynch Reps of Charles Lynch Esq Private dwelling with 2 rooms. Patrick Murphy Reps of Charles Lynch Esq Private dwelling with 3 rooms. Bryan Ruane Reps of Charles Lynch Esq Private dwelling with 2 rooms. Peter Ruane Reps of Charles Lynch Esq Private dwelling with 2 rooms. Oliver Gar Reps of Charles Lynch Esq Private dwelling with 2 rooms. Thomas Burke Reps of Charles Lynch Esq Private dwelling with 1 rooms. Patrick Walsh Reps of Charles Lynch Esq Private dwelling with 2 rooms. Patrick Sweeney Reps of Charles Lynch Esq Private dwelling with 2 rooms. Click on the Griffiths Valuation Page # 159 to see a list of tenants with plot numbers to match the Griffith map. The map has each renters plot numbered and recorded in the Valuation book so the exact location of your ancestors plot can be ascertained. Click on the Griffiths Valuation Ballinrobe Page # 159 to see a list of tenants with plot numbers to match the Griffith map. Gorta’ Tobair , field of the well. Situated in the north side of the parish. It is bounded on the N. by Lough Corrib; E. by the td. 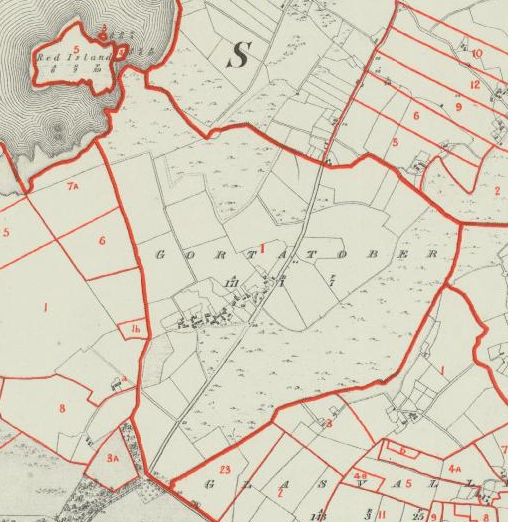 of Ballynalty; S. by Glasvally td. ; and W. by the td. of Ballycurrin. It contains 171a. 1r. 7p. and is the property of Captain Lynch, Ballycurrin House. It is let to tenants at will, in farms of from 7 to 22 acres, at the yearly rent of from 16s. to ?1 per Irish acre. The tenants are all Catholics. There is a large bog in this td.